Enjoy absolute waterfront, north facing, fully self-contained one, two and three bedroom apartments, all with a balcony overlooking the beautiful Maroochy River and west to the Hinterland of the Sunshine Coast. With boat ramp, fishing and swimming at the door and adjacent to a tranquil park setting. Reflections is "A Perfect Getaway". Walking distance to boutique shopping, Ocean Street market, restaurants,bars and cafes, 5 min drive to fabulous Maroochydore surf beach, central to Sunshine Coast attractions such as Australia Zoo, Underwater World, Glen Forest Sanctuary, world-renowned Coolum Golf Course to name a few. Relax in the park, cruise to Fraser Island, hire a jet-ski, wander around the Eumundi Markets for locally made craft and fresh food. Reflections offers magnificent views, peace and relaxation yet central to holiday fun. Spacious 1 bedroom fully self contained a/c apartment.. Large balcony,north-facing.Fabulous views over Maroochy River from sunny balcony. 3 storey walk-up. Spacious 1 bedroom fully self contained a/c apartment. 2 way bathroom, 2nd separate toilet. Large balcony, north-facing. Fabulous views over Maroochy River from sunny balcony. 3 storey walk-up. Spacious 2 bedroom fully self contained a/c apartment. 2 way bathroom, 2nd separate toilet. 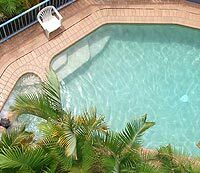 Large balcony,north-facing.Fabulous views over Maroochy River from sunny balcony. 3 storey walk-up. Spacious 3 bedroom fully self contained a/c apartment with ensuite, main bathroom & separate toilet.Large balcony, north-facing. Fabulous views over Maroochy River from sunny balcony. Spacious 3 bedroom fully self contained a/c apartment with ensuite, main bathroom & separate toilet. Large balcony, north-facing. Fabulous views over Maroochy River from sunny balcony. Please contact the office during office hours if checking in after reception closes. Children Welcome. There is a charge for extra guests. Secure lock-up garage with each apartment, extra parking available inside the security gate. Plenty of parking at the end of the cul-de-sac location for extra visitors. Boat ramp is right outside the front gate. Reflections Holiday Apartments boasts a prime riverfront location on the banks of the beautiful Maroochy River at Maroochydore. Maroochydore is centrally located in the heart of the Sunshine Coast and has the main CBD and shopping centre on the coast. The Plaza Shopping Centre, cinemas, restaurants, clubs, pubs and boardwalk cafes offer every style of food and are within 15 minutes walk. The lovely picturesque precinct of Cotton Tree is 30 minutes stroll or a few minutes drive with a swimming complex, cafes, restaurants and a local Sunday Market to explore. The Sunbus bus stops are located near-by to take you to the Plaza or further afield, perhaps Noosa to the north or Mooloolaba to the south. The Sunshine Coast Airport is a convenient 10 minute drive away and Brisbane Domestic and International Airport is an hour's drive. Swimming, surfing, beautiful patrolled long white beaches, learn to surf, hire a surf ski. River fun - boating, fishing, hire jet-ski, canoe, catamaran, dinghy. Sea kayaking, snorkelling and scuba diving, deep sea fishing. Level walking paths, buses to local clubs with regular entertainment, world-class local restaurants, walk to boutique shops and cafes, largest shopping mall on the Sunshine Coast. Visit Eumundi Markets - all local craft and produce, wander around the local flea market, Mooloolabah and Noosa tourist areas. Try whale watching, a river cruise, ferry cruise, Fraser Island tours, Maleny Hinterland tours, Everglades full and half day cruise, visit our beautiful golf courses. Go for scenic flights, tandem sky dive, horse riding. Take a deep-sea fishing tour, kayak or jet-ski tour, or maybe a 4 day camel island tour. Visit the famous Australia Zoo with "the Crocodile Hunter", the wonderful Underwater World, Ginger Factory, Big Pineapple, Big Kark Racing, Aussie World, Chattanoogah Pub, Opals Downunder, The Valley Rattler, Bellingham Maze, Monster Maze, Alma Park Zoo, Pitch and Putt, Queensland Air Museum, Bli Bli Castle, Nostalgia Town, Vineyards and Wineries, Australian opals. So much to see and do, something for everyone!